The image below has pictures of different chains and engraving options. Please choose medal size and chain. 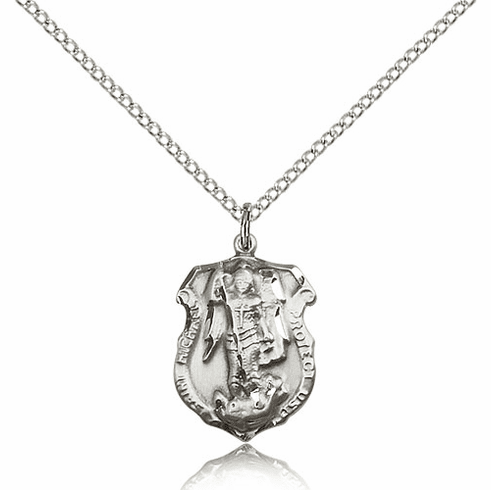 Engraving is available up to 3 lines 12 Letters on each medal. Available Type Fonts: Roman, Helvetica, Script, Monogram, & Monogram Circle. Monogram Fonts are limited to three letters. The back of all medals will be blank before engraving. Add words to be engraved in the box on this page and if you are using letter accent in your words please also add inscription at checkout in comments box. If your item(s) is engraved and/or personalized, the order is considered a final sale. So please double check your inscription to be engraved before you place the order. All orders that require engraving usually take 1-5 days to ship after the order is received. Bliss Manufacturing, a more than 100-year-old, family-owned company, makes all of its jewelry in the U.S.A. And because we make all of our jewelry, we are adding new designs daily, especially Patron Saint medals. We currently offer more than 450 different Patron Saint medals. Our jewelry is die-struck, the same way the U.S. Mint makes coins, which produces rich detail. Each Bliss medal carries a Lifetime Warranty. If for whatever reason a Bliss medal shall become tarnished, Bliss will either re-finish or replace the medal free of charge.